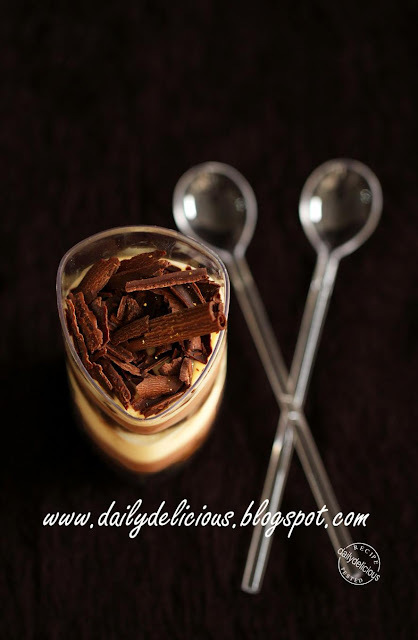 I can't stop myself when I saw the word "Tiramisu" ^^, and there are a lot of recipes for me to try. You can go for traditional one, or different flavors, but this time I think it's not too adventurous. 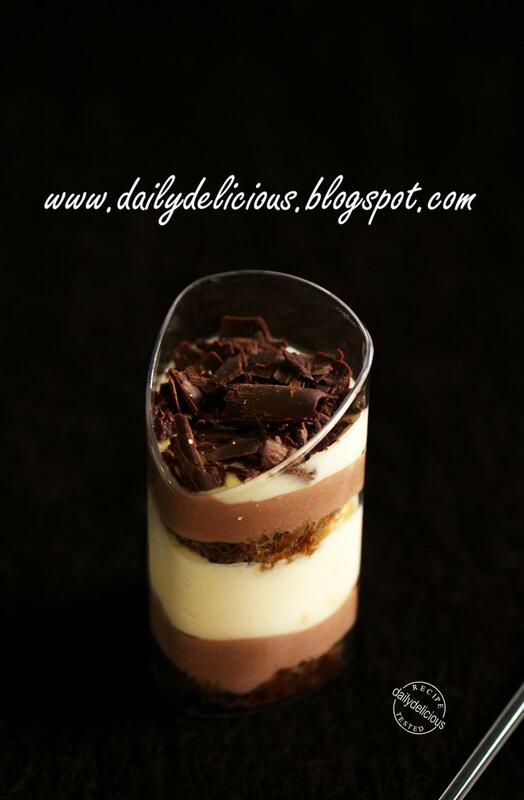 The additional taste is the Nutella, the chocolate and hazelnut spread that many people love it. I love the taste of the Nutella since I was a child, spread it over the bread and eat it with a cup of milk is my favorite meal. 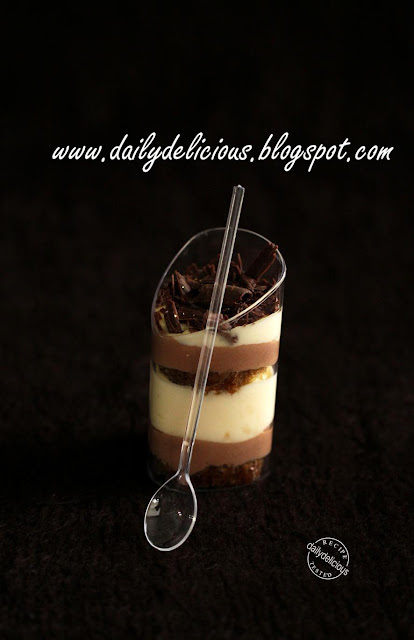 The main flavor of the Nutella is the hazelnut so I add the Fragelico into the tiramisu too, but if you you don't have it you can omit it ^^. How many people that you can serve from this recipe is really depend on the size of the glass that you use, but for me serving it in a small glass after dinner will be good because your guests will hope for more when they come next time, hehe. 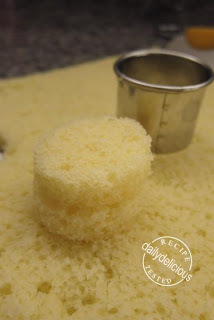 Cut the genoise into desired size. Warm the Nutella by putting in the bowl and place the bowl over a pan of hot water. 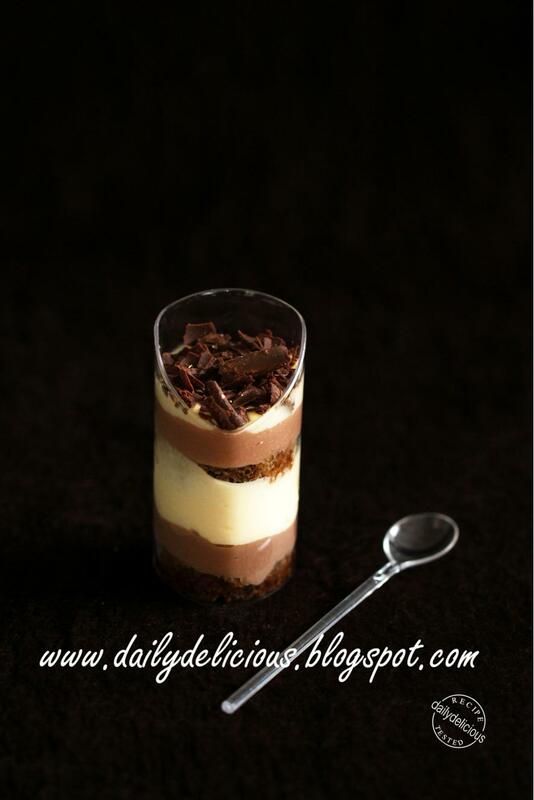 When the Nutella soften, put 170g of mascarpone cheese into the bowl with Frangelico and mix until combine. Beat 3 egg yolks with the sugar (A) until lighten in color. Stir the rest of the mascarpone cheese until soften, mix in the egg yolks and 1tbsp of Kahlua (A). Whip 5 egg whites with sugar (B) until firm peaks formed. 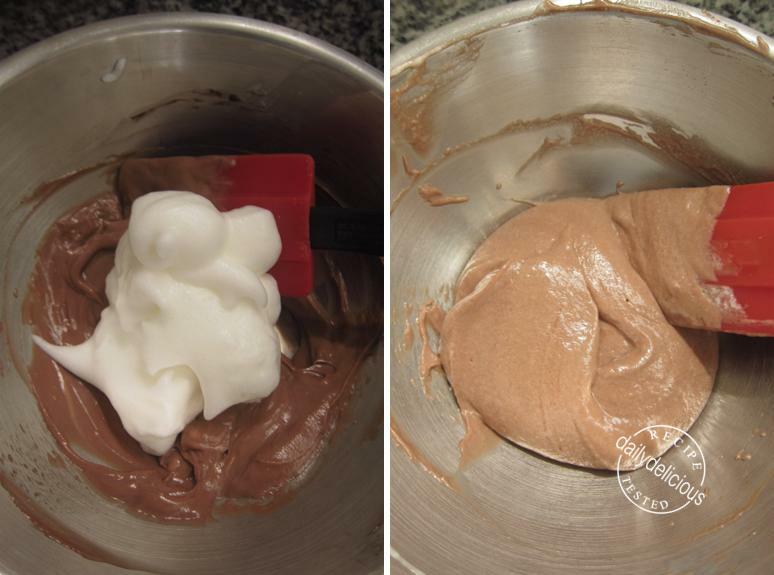 Fold 1/3 of the meringue into Nutella mixture. 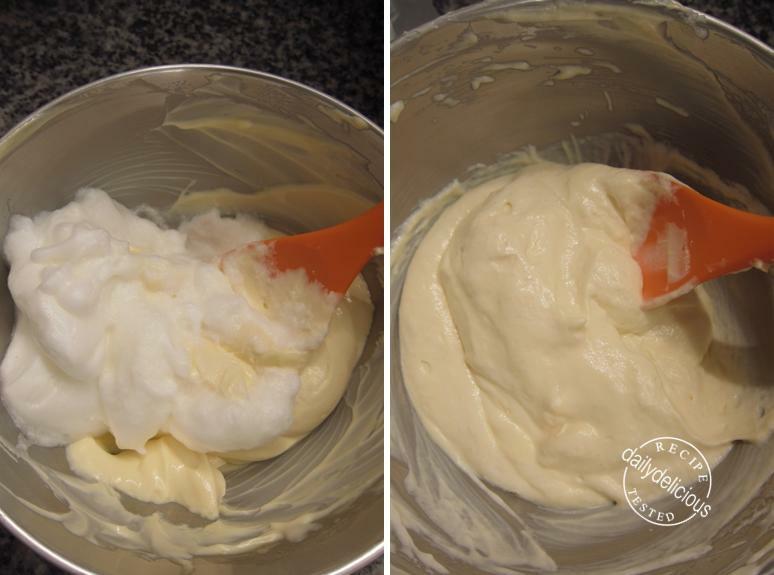 Fold the rest of the meringue into mascarpone cheese mixture. Mix the coffee with the Kahlua (B). 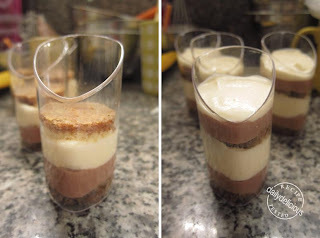 Dip the genoise into the coffee mixture and place in the glass, follow by the Nutella mixture. 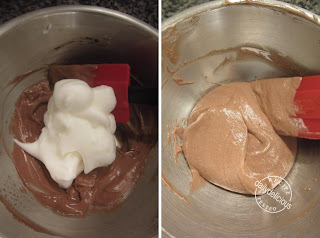 Put the mascarpone cheese mixture over the Nutella mixture and dip another piece of genoise into the coffee mixture and place it over the mascarpone cheese mixture. Spoon the Nutella mixture into the glass, and put the mascarpone cheese mixture over the Nutella mixture. 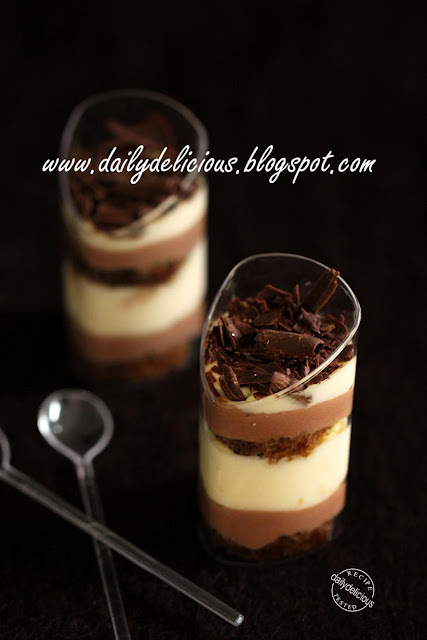 Put the chocolate curls on top, and refrigerate for 4 hours. Lovely recipe... but how much nutella did you use? 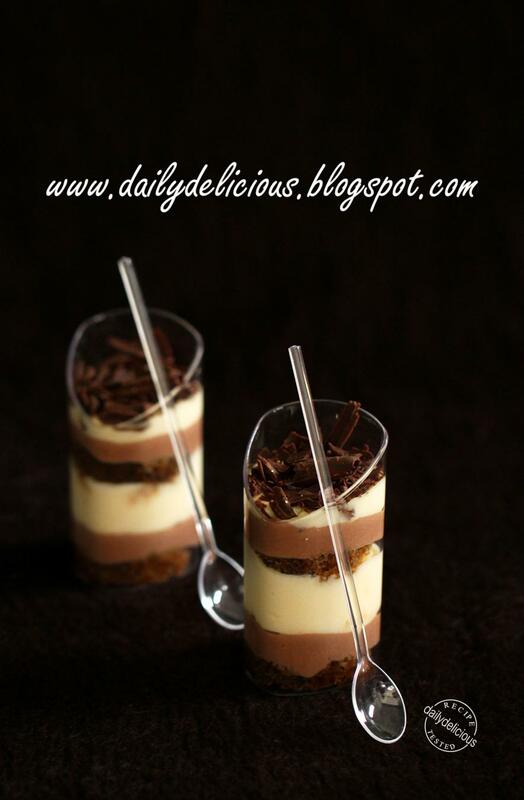 You should submit this recipe for Nutella Day! I just put the amount of the Nutella into the recipe, you will need 60g of it, and I didn't have any problem with raw egg. Dried Cherry Biscuits: Simply daily bake!